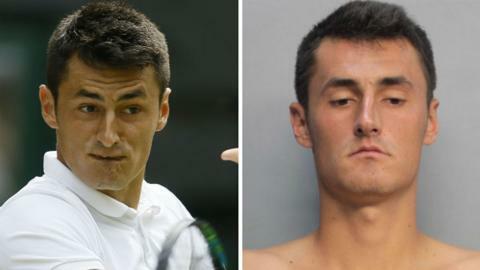 Australian tennis player Bernard Tomic has been charged with resisting arrest and trespassing by Miami Beach Police. The 22-year-old has been accused of refusing to leave his W South Beach hotel room after an alleged altercation with staff and police on Wednesday. Witnesses claim Tomic was asked to turn down his music following complaints from other residents. The Miami Beach Police account of the arrest said he "pointed his finger aggressively towards hotel security". World number 25 Tomic, whose address is listed as Key Biscayne, Florida on the arrest affidavit seen by BBC Sport, was in Miami after being omitted from Australia's Davis Cup quarter-final squad to face Kazakhstan this weekend in an ongoing dispute with Tennis Australia. He had played in the Hall of Fame championships match in Newport, Rhode Island, USA - which Tennis Australia referred to as 'Hall of Shame' in a media release. The governing body later apologised. Tomic, who was beaten in the first round in Newport, has accused Tennis Australia of abandoning him after hip surgery last year. The Miami Beach Police charge sheet alleges that the two-time ATP Tour title winner was asked three times by hotel staff to turn down music in his penthouse room in the early hours of Wednesday morning. It is then claimed that other guests in the room left, but Tomic remained and was taken to Turner Guilford Knight Correctional Center, where he was charged with resisting an officer without violence and trespassing. iWonder: What makes the perfect Wimbledon serve? Read more on iWonder: What makes the perfect Wimbledon serve?